Travis Konecny waits for teammates to help celebrates his game-winning goal in overtime to beat Detroit on Tuesday. DETROIT – For the second straight game, Travis Konecny scored a goal 27 seconds into overtime to lift the Flyers to a stunning victory. 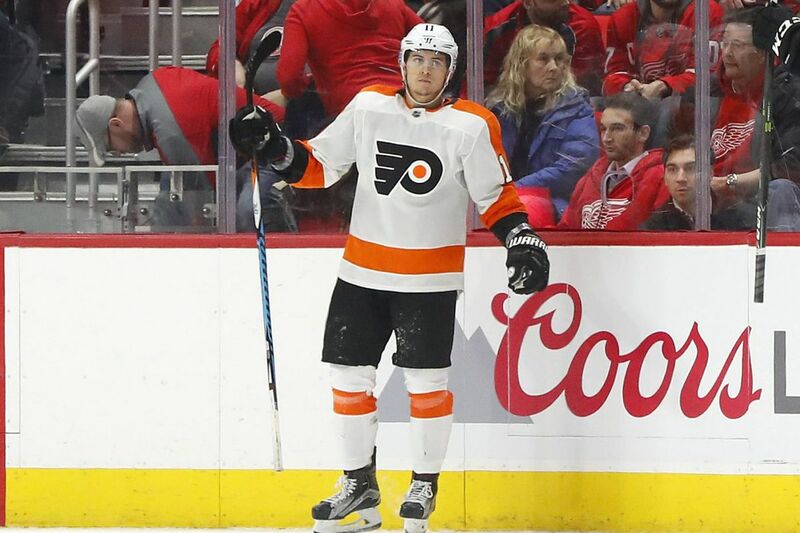 Konecny's right-circle drive gave the Flyers a 3-2 win Tuesday night over the Detroit Red Wings at Little Caesars Arena. The goal was reviewed for offside, but it stood. "Just as I touched the puck, my skates just tagged on the blue line," said Konecny, who hustled out of the zone to get back onside after the puck came out for a split second. Konecny and linemates Sean Couturier and Ivan Provorov have won the Flyers' last three overtime games on the first shift of the extra session. "It just seems to be working; we're not thinking and just having fun and making plays," Konecny said after becoming the first Flyer to score back-to-back overtime winners since Sami Kapanen in 2005. "And when there's opportunities, I know Coots is going to throw the puck there and let me skate. He threw that flip up the ice and it ended up working out." It was the Flyers' fourth straight win and their eighth in the last nine games. The Flyers didn't have much success at Detroit's previous two homes, and they hope their first trip to the Red Wings' fancy new digs is a sign of things to come. Detroit's Frans Nielsen scored on a scramble in front with 9:16 to go in the third period to tie the game at 2-2. A boarding penalty on Robert Hagg gave the Red Wings a power play with 5:27 left in regulation, but the Flyers killed the infraction. Jake Voracek had a goal and an assist as the Flyers overcame a listless first period and took a 2-1 lead into the third period. It was Voracek 20th multi-point performance of the season. Voracek, who leads the NHL with 46 assists, set up Andrew MacDonald's first goal in 29 games, a drive from the high slot, to knot the score at 1-1 with 18:50 left in the second period. Michael Raffl, who was injured later in the game, set a screen in front. "Jakey made a great play down low to get it past their winger to the middle of the ice," said MacDonald, whose sizzling team hosts Tampa Bay on Thursday in its final game before the all-star break. "Raffy did a great job of taking away the goalie's eyes. There was a lane on the close side and I just tried to get it off quick toward the net." The goal ended Petr Mrazek's scoreless streak at 145 minutes and 5 seconds. Flyers defenseman Ivan Provorov (left) and Red Wings right wing Luke Witkowski battle for the puck in the second period on Tuesday. With 36.4 seconds remaining in the second, Voracek gathered a rebound of Couturier's shot, made a move in front and beat sprawling goalie Mrazek to put the Flyers ahead, 2-1. The Flyers snapped a 0 for 13 power-play slump. The Flyers dominated the second period, outshooting the Red Wings, 18-7, and had a strong cycle during most of the session. Down at the other end, Brian Elliott made point-blank saves on Luke Glendening (shorthanded) and Tyler Bertuzzi in the second. Detroit had played the previous night in New Jersey, so it wasn't surprising that the Red Wings came out flat in the opening period. It was surprising that the rested Flyers, coming off Sunday's impressive 2-1 victory in Washington that was won by Konecny, had no zip in the first 20 minutes. Passes didn't connect. The players looked like they were skating in quicksand. Shots were scarce. "It was a tough start; we weren't skating and didn't seem to get anything going," said Couturier, who finished with a pair of assists, "but we came out strong in the second … and we got it done." When the sleepy first period ended, the Red Wings had a 1-0 lead on a gift goal — a point drive by defenseman Jonathan Ericsson deflected off Flyers defenseman Brandon Manning's skate and caromed past a startled Elliott with 9:18 left in the session. Heading into Tuesday, the Flyers held the first wild-card spot in the oh-so-crowded Eastern Conference playoff race. One point separated the four teams battling for the two wild-card spots. In addition, the Flyers began Tuesday just one point behind third-place Columbus in the Metropolitan Division and two points behind second-place New Jersey. The top three teams in the division get automatic playoff berths. "Every night is so close," coach Dave Hakstol said before the game. "I feel like every night, there's different points in the game that can take it one direction or another … and if you're not as sharp as you can be, all of a sudden, you can find yourself in a bad stretch of results." Like their 10-game (0-5-5) losing streak earlier in the season. Since then, the Flyers are a blistering 16-5-1. Good night, good hockey...good for the #Flyers to find a way to win a game they would have surely lost in Nov. or Dec.